[click here] for the text of my letter sent July 29, 2008, from the Brattleboro, Vermont, Post Office to US President George W. Bush. Grand Jury systems and the need for them explained [video]. 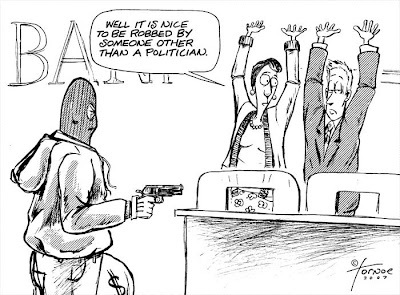 Effective Grand Juries, acting independently, is what corrupt officials, police, prosecutors, judges, and defense attorneys fear most. To: Connecticut State Representative Drew, Thomas J.
I would like to pass onto you a number of individuals that can attest to the same thing regarding what is going in Connecticut. Mr. Drew are you interested in having me pass names onto you or to someone else in the legislative branch? I am talking about public corruption of the Department of Administrative Services (DAS), the Judicial Branch, the Connecticut State Police, and other agencies, departments, individuals, and their families and associates. The Connecticut DAS IP address seems to be involved in the hacking and harming of websites, possibly even in attempts to make computers permanently crash. Numerous individuals could report of the judicial misconduct of Judge Jonathan Kaplan, Joe D'Alesio and others. Should there be defrauding of taxpayers, nepotism, retaliation, obstruction of justice, and the fixing of court cases going on within the Connecticut Judicial Branch? Judicial branch employees that allege misconduct of others don't have their claims investigated, they are sent out on unpaid leave, fired, and judicial marshals, private investigators, and other thugs are sent out to harass their family and friends. I think there should be a special legislative hearing to call witnesses to public corruption. This public comment [video] was sealed from the public by the brass of the Connecticut Judicial Branch. Andrea Wilson and another judicial branch employee blow the whistle to judges, managers, and VIPs at an official hearing. This testimony and that of the public was hidden so the judicial branch could give itself straight A's in a rigged survey [video] paid for by tax dollars. The Connecticut State Police "club" for misconduct, "The 100 Club" for falsely arresting motorists for DUI. [more] False arrests lead to prison, family break ups, job loss ... loss of productive taxpayers! [click here] for video "Prison for Downtown Taxpayers"
Drunk officers passing baggies of pot out at local bars partying like rockstars with female DCF workers? Are some officers too drunk and high to return to HQ with cruisers? Click on document for a larger view. 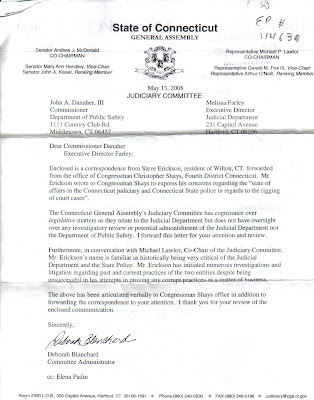 I contacted Congressman Shays' office regarding the public corruption in the Connecticut Judicial Branch, courts, and Connecticut State Police. I have brought NO legal action. I have not been to a Connecticut court on ANY matter since the criminal railroad job by Judge Kaplan in Rockville. I have complained and have got NO RESPONSE back regarding any complaints made. The Statewide Grievance Committee refused to schedule a hearing even though Atty Michael H. Agranoff did not give me my legal file, did not file a reason or appeal my case, could not explain financial discrepancies, and could not produce or find paperwork INCLUDING the attorney/client agreement where he ASKED ME for a copy of mine as he had lost his! Tell me the lawyer overseeing lawyers in Connecticut is fair! I complained about Judge Jonathan Kaplan to the Judicial Review Council. They refused to investigate. Tell me judges judging judges is fair! Atty Gen Blumenthal's Office refused to answer Congressman Simmons letters and calls asking Blumenthal to just read my trial transcripts. Tell me the Attorney General serves the people before his law partners, friends, and others in offices with something to hide! The Connecticut State Police Internal Affairs Officer, LT Wack refused to take my complaint against his "Friends". Tell me police can police police! Kaplan allegedly conspires to contact Massachusetts judges to blackball Johnson and set her up for a fall. Barbara, too, ended up "mouthy" in print, and paid the price. Should Police target homeowners to railroad to prison when they complain about vandals, break-ins, teen prostitutes doing business within eye shot of children, heroin, crack cocaine, and marijuana dealing going on 24 hours a day interrupting taxpayers' sleep? My daughter, Sarah, was 14 at the time this message was left. Coukos caught me out in my back yard and started slapping me in the back of the head, saying "Turn around coward, I want your daughter to get on her knees and blow me." I had already been attacked on my property by a police informant, only I was arrested, and I ended up getting a year in prison for pepper spraying him, ending the beating I took in that incident. So, if I ended up defending myself against the punches I was taking from Coukos, again, only I would be arrested. Peter Coukos was allegedly offered help in obtaining a Connecticut pistol permit for terrorizing me and my daughter out of Connecticut, to attack me, and to try to set me up for another false arrest. Coukos drove drunk while slamming his car into an African American woman over a racist road rage incident, is known to have abused, or is still abusing alcohol, crack cocaine, marijuana, prescription drugs, and has been, or is a chronic frequenter of prostitutes. [click here] for Steven G. Erickson pictures and for the story of the beginning of the saga. Freespeech.com links in post no longer work in that international injustice busters webpage. US Marine arrested by Connecticut Police after waking up with 13 stab wound for causing a disturbance while being stabbed. Felon on probation, David J. Taylor, wasn't even violated on probation for almost killing 3 people. Judges, prosecutors, lawyers, and elected officials band together to retaliate against "mouthy citizens". Ritt Goldstein helped organize a hearing held at the Hartford Capitol Dec. 1996. The Judiciary Committee Legislators heard from international experts on Civilian Oversight of Police and victims of Connecticut State and local police misconduct. Ritt fled to Sweden seeking political asylum soon after making [this video] being so terrorized by police. WASHINGTON (CNN) -- The controversial interrogation technique of waterboarding has served a "valuable" purpose and does not constitute torture, former Attorney General John Ashcroft told a House committee Thursday. John Ashcroft says waterboarding yielded more valuable information than other interrogation techniques. Testifying on the Bush administration's interrogation rules before the House Judiciary Committee, Ashcroft defended the technique while answering a question from Rep. Howard Coble, R-North Carolina. "Waterboarding, as we all know, is a controversial issue. Do you think it served a beneficial purpose?" the congressman asked. "The reports that I have heard, and I have no reason to disbelieve them, indicate that they were very valuable," Ashcroft said, adding that CIA Director George Tenet indicated the "value of the information received from the use of enhanced interrogation techniques -- I don't know whether he was saying waterboarding or not, but assume that he was for a moment -- the value of that information exceeded the value of information that was received from all other sources." Waterboarding is a technique designed to simulate drowning. The agency has acknowledged using it on terror suspects. Some critics regard it as torture; others say it is a harsh interrogation technique, and proponents say it is a useful tool in the war on terror. Ashcroft, who stated his opposition to torture, said the Justice Department has determined that waterboarding -- as defined and described by the CIA -- doesn't constitute torture. "I believe a report of waterboarding would be serious, but I do not believe it would define torture," Ashcroft said, responding to questions from Rep. Maxine Waters, D-California. He added, "the Department of Justice has on a consistent basis over the last half-dozen years or so, over and over again in its evaluations, come to the conclusion that under the law in existence during my time as attorney general, waterboarding did not constitute torture." Waters asked Ashcroft whether such techniques would be regarded as "totally unacceptable and even criminal" if they were used on American soldiers. 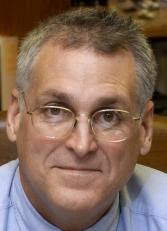 "Well, my subscription to these memos, and my belief that the law provides the basis for these memos persisted even in the presence of my son serving two tours of duty overseas in the Gulf area as a member of our armed forces," Ashcroft said. Rep. Steve Chabot, R-Ohio, asked Ashcroft how many times waterboarding had been performed. Ashcroft said that it's his "understanding it has been done three times" as part of an "interrogation process." He said he thinks the subjects of the interrogations "would be labeled as high-valued detainees." The House of Representatives failed to muster the two-thirds majority it needed this year to override President Bush's veto of a bill that would have banned certain CIA interrogation techniques, including waterboarding. The White House applauded the vote, saying an override "would have diminished the intelligence community's ability to protect our nation." The bill was an effort to curtail the CIA's ability to use harsh interrogation techniques that the military and other law enforcement agencies ban. It would have restricted U.S. interrogators to techniques outlined in the Army Field Manual. The White House said the restriction "would have eliminated the legal alternative procedures in place in the CIA program to question the world's most dangerous and violent terrorists." David Cummings speaks out at the Hartford Connecticut Supreme Court 12-3-07 at a special hearing on ethics in the Connecticut Courts. Bigwigs in the Connecticut Judicial Branch sealed public comment from the public. The Judicial Branch then gave themselves straight A's in [this video]. Judge Jonathan J. Kaplan came up a lot, as well as Rockville Superior Court ... complaint after legitimate complaint. A Google online book is just amazing for its information on Windham County in Connecticut. No, no TV for me. I will try and get to the local library if they still have a great pamphlet I can no longer remember the name of; there’s a mid-50s version before the wave of local reform and a post-reform version that explained Connecticut government in good detail. That brochure was actually a cooperative project with one of the Federal foreign aid agencies since it was designed for students from foreign governments. A lot of the rest is just a collection of numerous books & reading over the years. There are many that have a problem on all holidays, including the fourth. Bill Dorriss was an antiques dealer in New Haven. His dog bit another dog. Because there were children across the street, he was charged with multiple counts of risk of injury to minors because they witnessed the incident. Dorriss faced spending the rest of his life in prison. He lost his business and fled the tyranny of Official Connecticut. Ritt fled the US soon after making the above video to seek political asylum in Sweden. Connecticut police terrorized him that much. Happy 4th of July. Celebrate "Freedom"
[click here] for the journalist, and former Green Party campaign manager for Connecticut Governor, who was on the Connecticut State Police secret "Enemies List" and was arrested on sight, facing prison.